Rhino Mat Ultra-Dome workstation anti-fatigue Mat. Designed for worker comfort, Ultra-Dome's unique hollow rubber dome design encourages frequent yet subtle changes in posture, inducing natural flexing of muscles, thus reducing the build-up of lactic acid that causes fatigue. 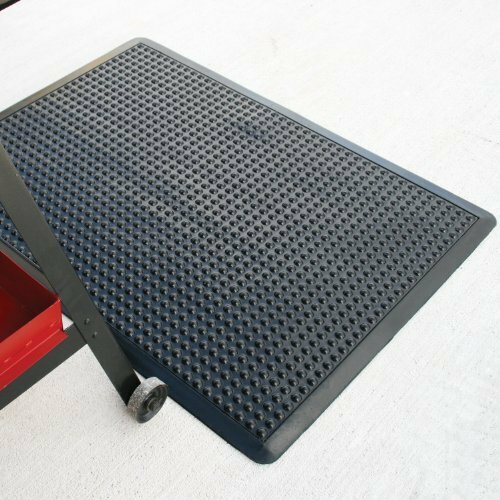 Perfect as a single work-area mat, check stands, assembly stations, convenience stores. Single piece molded beveled borders on all 4 sides allow easy employee access. Solid and drain-thru mats available. Black color with black bevels.